“It’s your turn. Try to get a strike — but I’m winning,” my 6-year-old son, Jared, told a resident of the memory care unit at Sunrise at George Mason, an assisted-living facility in Fairfax. She rolled the plastic bowling ball. All the pins fell. She smiled. Not one to lose gracefully, Jared mumbled, “Good job,” and flopped onto an ottoman to sulk while his friends Brice Bartley Jr., 10, and Marilyn Bartley, 8, set up the pins again. Nearby, my daughter, Ellie, 8, giggled as she tossed a balloon to our favorite resident: my mom, Loraine Collins, 83, who has lived in the unit known as Reminiscence for two years. This was a typical scene on Thursdays this summer when my kids and a revolving handful of their friends, ages 2 to 10, visited as volunteers, part of Sunrise Senior Living’s Intergenerational Program to encourage engagement between the elderly and youngsters. The children made bead bracelets, played ring toss and generally entertained the 20 or so residents who have cognitive impairments such as Alzheimer’s and other forms of dementia. But the seniors aren’t the only ones who reaped benefits from these interactions. Children who spend time with adults with dementia develop social and emotional competencies, such as empathy, patience and problem-solving, according to a 2018 study by Generations United, a D.C.-based nonprofit, and the Eisner Foundation. The adults were less agitated and more engaged during interactions with kids than during other activities, the study added. What’s more, elementary-school-age participants in intergenerational programs demonstrated a greater ability to regulate their behavior, while 97 percent of adults who participate in such programs said they felt happy, loved and needed, according to the report. That’s why some senior living communities are making intergenerational interactions part of their daily activities. Erickson Living, a retirement community operator with three properties in the D.C. area, has a program in which high school students work as servers in the communities’ restaurants and dining rooms, and can earn college scholarships. Since 1998, 4,492 students have participated at those locations, and in 2017, the company gave $450,750 in scholarships to servers there. “One of the biggest things [I learned] was emotional control, I guess you could say, because we are [in] a senior living community, and one day you could be talking to someone and the next day they’re not here. It was very tough for me at first … but later on, it started making me value life a little bit more,” said Henry Munoz, a 21-year-old marketing major at George Mason University. He was a server at Erickson’s Greenspring community in Springfield from ages 14 to 18, and he is now a sales and marketing intern there. Programs exist nationwide. 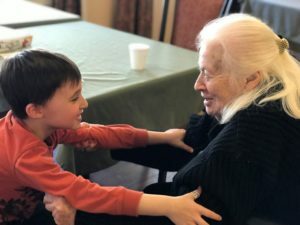 Intergenerational Living and Health Care, a Minnesota-based nonprofit, developed the Intergenerational Learning Center, a school for children 6 weeks to pre-K, next to a senior living community whose residents work with the kids. The Providence Mount St. Vincent in Seattle, home to 400 adults, has an on-site child care center. Of course, seniors get a lot out of the intergenerational interactions, too. For my friend Sheila Bartley, Marilyn and Brice’s mom, bringing her kids to Sunrise was a way to take them outside their comfort zone.